Over the last months, the electronic suspense was seriously raised with a teaser website, a campaign on TMF and a number of much-talked-about events, including Deaf Disco and an own club at Rock Werchter. At the beginning of September, the time will finally have come for the interactive website www.redbullelektropedia.be to be officially launched online. 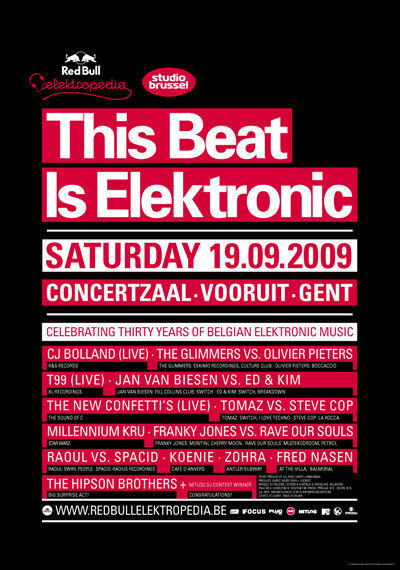 To celebrate the launch of the final website, This Beat Is Elektronic will be hosted on Saturday 19 September, a large party in the Vooruit with a long line-up of legendary Belgian deejays and musicians – from the past to present. All have played an important role in the history and development of the electronic music scene in Belgium. CJ Bolland made his first records in 1989 with the legendary R&S Records label (Ghent) and got Belgium noticed in the worldwide dance market when he landed high in the American charts with his mega hit ‘Sugar is Sweeter’. Since then, he hasn’t stopped en we still see him on many festivals, both solo and with Tom Barman as Deus. At the end of the ‘80ies the Belgium music scene exploded with the birth of New Beat. 120 BPM became the norm and one of the first New Beat anthems to conquer the world was ‘The Sound of C’ from The Confetti’s. Now they are back as The New Confetti’s (a tribute to – euh – The Old Confetti’s). In 1991 it was T99, made up of Olivier Abbeloos and Patrick De Meyer, who represented Belgium in the English charts when they ended on n°4 with ‘Anasthasia’. The track would later also be used in the British cult movie ‘Human Traffic’. Ghent was a special breeding ground for talent in the middle and at end of the ‘80’ies also. In the city centre clubs as ‘55’ where Mo&Benoelie were the undisputed kings, attracted the first clubbers. Mo&Benoelie later moved their dj-art to Culture Club and the Free the Funk and Eskimo parties for whom they also compiled and mixed several compilation cd’s. They are now better known as The Glimmer Twins and travel the world. Just outside of Ghent, the famous Boccaccio club, was an important place of gathering and catalyst for the newly developed New Beat genre. One of their residents, Olivier Pieters, could not be forgotten on a party about the Belgium electronic scene. Jan Van Biesen, once upon a time resident in the legendary Fill Collins club in Antwerp, contributed a lot to the diffusion of electronic music, by convincing the national radio station Studio Brussels to dedicate Friday and Saturday nights to electronic beats only with Switch. And also Ed & Kim have been contributing a lot to Switch. They started their careers in the Fill Collins Club and Club Geluk, are a steady value on the Funk You! Parties and organize really cool parties themselves with Breakdown and Smile. One of the big ambassadors of the Belgian house scene abroad is without a doubt DJ Raoul. His Aroma label has been loved and adored by the biggest house jocks and fans all over the world as well as his Swirl People project. He also brings us all the latest house info and records in Switch. Belgium found an ambassador of the more underground genres as acid, electro, techno en disco in Spacid. With the collective Funky Green Aliens he organized a lot of legal and illegal raves all over the country, he also runs Radius Records and is an important player behind different concepts. He was and is also active as resident for some of the most popular party concepts our regions have known: Body2Body, Retro Acid, Beats of Love, and so on .. When we think about the Belgian electronic scene , it’s impossible not to think about Bonzai Records. The then so called ‘Bonzai sound’ was at the absolute European top of clubbing during the mid ‘90ies. One of their biggest hits was Jones & Stephensons ‘The First Rebirth’ and Franky Jones (Jones) will represent this famous label. He gets the company of RaveOurSouls, a duo from Limburg who will bring a mix of acid, rave, new beat, electro-clash and funk. From 1994 till 1999 2Fabiola dominated the Belgian and European dance charts. In the mean-time front lady Zohra, taught herself how to dj. and managed to built a respectable reputation as a dj. all on her own. She will not be bringing the 2Fabiola hits but a mix of old and new classics for the evolved clubber. And just to underline our point that electronic music is very divers and entails a very broad spectrum of genres, also the Millennium Kru will be part of this line-up. Because even Drum ‘n’ Bass found it’s way to our dance-floors and was in large part championed by the MillenniumKru, from lots of small parties to the biggest festivals. Now that they’ve split up, this will be the first set of Millennium Kru in two years! The Hipson Brothers are a new dj-duo, consisting of two living legends of the Belgian nightlife. They don’t take themselves too seriously but have been around for quite some time! Who are they? That’s a secret for now. A second big representative of house in Belgium is definitely Koenie from the Antwerp based Wally’s Groove World label, record store and parties. He started his career in 1985 in de USA Import and introduced house in Belgium with the Willy Wonka and Ladybird labels. In the middle of the ‘90ies another sub-genre was born and it was called tech-house. One of it’s biggest fans and distributors was Fred Nasen. He had been around a lot longer at clubs as At The Villa, Balmoral and H20, but then also launched his Visitor label which has been followed up more recently by Dogtown Records. Red Bull Elektropedia will be the largest online archive of the history of the Belgian dance scene. Just think of internationally renowned clubs like Boccaccio, Fuse, Zillion and Culture Club; the infamous parties like I Love Techno, 10 Days Off, Free the Funk and Eskimo; leading bands and musicians like Telex, Front 242, CJ Bolland and Soulwax/2ManyDJs; popular deejays like The Glimmers, Marco Bailey and Dr. Lektroluv; and respected labels like R&S, Bonzai and Eskimo Recordings. But also think of legendary radio shows like Liaisons dangereuses (with a young Sven Van Hees) and Teknoville (Studio Brussel); record sleeve designers like Marc Meulemans and Daan, and even fashion designers like Walter Van Beirendonck, who was inspired by the techno scene at the beginning of the nineties, and who was one of the first to put it onto the catwalks in Paris. At Red Bull Elektropedia, everything and everyone has its/his own page, on the condition that they have meant something in electronic music or within the club scene. Compared to its (dull) big brother Wikipedia, Red Bull Elektropedia will not limit itself to endless biographies and dry facts. On the website, flyers, posters, pictures, newspaper cuttings, record sleeves, tickets, video clips, deejay sets, and (pictures of) T-shirts, wristbands and lighters will also be stored for eternity. Over the last 30 years, a lot of those things have been lost, and that has to end for once and for all, because it includes too much valuable material, which illustrates the (large) role our country has played in the history of electronic music. In September, a special book about the history of the Belgian club and electronic music scene will be published by Ludion, the publishing house known for its books on Luc Tuymans, Elke Boon, the Antwerp Six and others. Ben Van Alboom, who as a nightlife journalist and presenter of Switch (Studio Brussel) was hired to help set up Red Bull Elektropedia, is editor in chief of the publication, which will be called : This Book Is Elektronik. From Wednesday 9 September, for four weeks, there will be a documentary series about the history of the Belgian night scene on TMF. The programme will obviously include a lot of significant video clips, but also exclusive interviews with Front 242, The Subs, The Neon Judgement, The Glimmers, Luc Van Acker, Jimmy Dewit (Shameboy), Zohra, Dirk Ivens (Klinik), Goose, CJ Bolland, Rudy Victor Ackaert (Culture Club), Sven Van Hees, Renaat Vandepapeliere (R&S), Peter Decuypere (Fuse, I Love Techno), Filip Vandueren (Milk Inc.), Olivier Adams (Praga Khan), Jan Van Biesen (Studio Brussel) and many more!